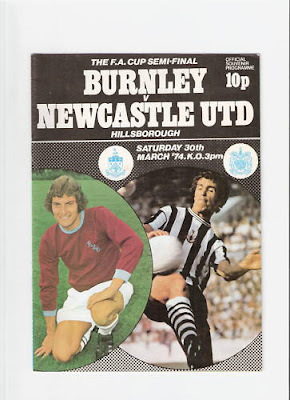 The build up tih this game started a week orlier when tickets went on sale at St. James', on the day after wi'd drew one's each with Leicester in a League game. Some fans had even left the game at HALF TIME? tih be forst in the queue! and mek sure of their 'precious' semi-final tickets!. Me and mee mates wornt THAT daft, and wih went on the hoy after the game, retornin' anly when they'd hoyed us oot the 'Star' in Westgate Road, at chuckin' oot time! Wih joined the huge queue at midneet on Barrack Road and tih keep waam some fans had ripped the fences doon in the nearby allotments tih mek 'bonfires' on the path!. Eleven lang hours later the ticket office opened and after the mad rush when they opened the gates, we were in possession of the 'priceless' £1:00! standin' tickets for the Penistone Road Terrace!. It sez a lot for the futbaall stadiums of tihday, that Hillsborough in the mid seventies was probably the best club groond in Britain!. Wi'd travelled doon on the train tih Wadsley Bridge Station which lies on the steep hill above Hillsborough. Ower 30,000 fans had travelled doon from Tyneside that day which included quite a few who had tickets for the Burnley end and everybody was convinced that wi'd dee it!. Once off the train we went in search of a 'drinkin' den' and heeded for the city centre az aall the boozers aroond the groond seemed tih be shut!?----BUT! oh no they were'nt! They WERE open, but anly for the locals who could be seen through the frosted glass, enjoyin' an 'Arthur' or two behind locked doors!. Wih seen a 'Dibble' and asked him where wih could get a 'gargel', and he pointed us in the direction of a windy lane and he said there was a boozaa aboot qwaata of a mile away, that would sorve us!. And so it was off to the nearest bus stop tih catch a bus tih the 'big city', tih try and find a 'gargel-stop'! tih quench wor tonsils!. On wor arrival, and after wanderin' aboot like 'heedless chickens', wih eventually foond one who would let wih in, and stayed there for the 'duration', az it looked like bein' the anly place that wi'd get in tee!. It was then off tih the match----the biggest day so far in mee Toon Travellin' Career!. The atmosphere when wih got in the groond was the best a'd ever experienced and the shear mass of the Toon fans on that huge terrace was somethin' aall aalways remember. There were black 'n' white flags everywhere and of course in them days it was aalmost 'compulsary' tih wear a scarf or wooly hat to a game. When the 'Blaydon Races' was sung, the whole end waved their scarves and banners and it was hard tih see anythin' at aall on the pitch. Luckily, the game had'nt started yet so meesel and 'Dylan' foond a good vantage point in the middle of the 'mass' and waited for 'battle to commence'!. The players ran oot to a rapturous reception with nearly aall the noise comin' from the Newcastle fans. Burnley must have won the toss and they made the Toon kick towards wor own fans in the forst half!, obviously hopin' that this would be tih their advantage come full time!. It aalso meant of course, that THEY had tih kick towards there own fans for the openin' 45 minutes!. It looked az though their 'tactics' had paid off in the forst period az 'The Clarets' had more of the play and the Toon worryingly looked owerawed by the ocassion, tih say the least!. After the break the Toon seemed like a re-vitalised side and went 'hell for leather' tih break the deedlock. The roar from the Toon fans on 'Macs' opener must have been hord back on Tyneside! az 'The Army' celebrated!. 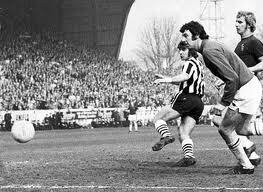 Just after this, McFaul, in the Newcastle goal made a tremendous save to deny Bornley. And then 'Supermac' struck again tih book wor coverted place at the 'Twin Towers'. Terry Hibbitt sent him clear and ah swear blind that he 'burnt the grass', such was his speed az he 'scorched' towards the 'Leppings Lane' goal. We were gannin tih Wembley for the sixth time in an FA Cup Final and had NEVER lost one there! SO THERE WAS ABSOLUTELY NEE WAY WE COULD LOSE IT!---“NEE WAY!”---“NEE WAY!”.